Home > Blog > Questions & Answers > What is the Best Way to Handle Another Person’s Insurance Company after a Car Accident? What is the Best Way to Handle Another Person’s Insurance Company after a Car Accident? I was in an automobile accident and my car was totaled. It was the other driver’s fault. How should I deal with their insurance company? Many experts would advise you against speaking with the other person’s insurance company. While you do need to call your own car insurance company to report the accident, you are under no obligation to talk to the other driver’s insurance carrier. The best way to deal with the other insurance carrier in most serious car accidents is to consult with a personal injury attorney. He or she will deal with them. Negotiating the lowest possible settlement possible on other car accident claims. This boils down to the following: to reduce claims they pay, the insurance company must deny claims made. Most car accident victims aren’t insurance adjusters or attorneys. The insurance adjuster knows that. You’re on their home field and it’s their rules. They will use their superior knowledge of the insurance claims game against you. By talking to the insurance adjuster for the other driver, there is a good chance that you are mucking up your own case. That insurance company will try to use whatever you say against you later in the claim, whether it was your fault or not. Insurance adjusters are very well trained to use what you say against you. Look, there is no legal requirement for you to cooperate or talk to the other insurance company. But this will rarely or ever stop that insurance company from trying to contact you. If they do, it’s a good idea to not take the call and to talk to an attorney. When you do speak to anyone about the accident, note the details of your conversation in your post-accident journal (link opens printable PDF form). Enjuris tip: If you do talk to the other driver’s insurance adjuster and they want to record the conversation, do not do so! You definitely should talk to a personal injury attorney. A recorded statement may be very damaging. Sometimes, your statement may actually show that you do not have a valid accident claim. If you don’t have a claim, your injuries and property damage are on you. The insurance adjuster will look at the statement you give them with the statement you gave the police. They also will read over the statement you would make if the case involves a lawsuit. If they spot any inconsistencies in these statements, the claim might get denied. It’s not unusual for a person to tell the accident story slightly differently if he gives it four or five times over three months. Adjusters will often ask you tricky questions that can make you answer in a way that hurts your claim. Occasionally, an aggressive adjuster may push you to agree to facts that you don’t know are accurate. You might get annoyed, and say, ‘I guess so,’ to get the guy to leave you alone. That could hurt your case big time. If your car accident case goes to trial, the defense can use your recorded statement to the insurance company to cross examine you. That could have been months ago, and heck if you can remember what you said. Any contradiction you make with your previous statement can be very damaging. A good defense attorney will highlight the discrepancy for a jury and make hay out of it. Let’s be fair: Not every insurance company will play games with you on the phone. But if they do try to undermine your case, it can really screw things up. See the steps to an insurance claim settlement to get an idea of the overall process. Enjuris tip: If you feel you were mistreated by an insurance adjuster, you should report it to your state’s department of insurance. Find your state’s insurance department at the National Association of Insurance Commissioners. If you had a serious car accident and had major injuries, your full medical diagnosis may not be complete. You could give an inaccurate portrayal of your injuries. Once the adjuster has the reserve value in mind, good luck getting a settlement above that amount. If you talk to them without an attorney, you could give out inaccurate information that sets an artificially low reserve amount. That boosts the odds that a lawsuit will have to be filed. Which means you could have to wait months to get paid. If you win. If you lose, you get nothing. We’re talking car accidents and insurance companies, so there are exceptions. If you have a minor car accident, the other driver is 100% at fault and it is clear, you might talk to the other adjuster to get the matter settled fast. You might consider doing so if the police report states the other driver caused the wreck. If the other driver was cited by the police – even better. Enjuris tip: If your car accident was minor and injuries are minor, maybe you don’t need an attorney. Read this Enjuris article for tips on when you don’t need an attorney. As we noted earlier, you do have a contractual obligation to cooperate with your car insurance company. Your insurance policy may contain language that requires you to give a recorded statement if the adjuster requests it. If they do ask, you can ask the adjuster to tell you the exact language in the contract that requires it. Remember that your own insurance company can potentially take a position against you. So, you should think very carefully about every fact you give in a recorded statement to your insurance carrier. But many experts would advise you to not give a recorded statement to any insurance company at all without the advice of a personal injury lawyer. Get in touch with a personal injury attorney today if you aren’t sure about dealing with either insurance company. Our handy law firms directory can help. We’re sorry to hear about your accident, Bp. When in doubt, we recommend contacting a car accident attorney near you to find out if that’s normal and protect your legal rights. 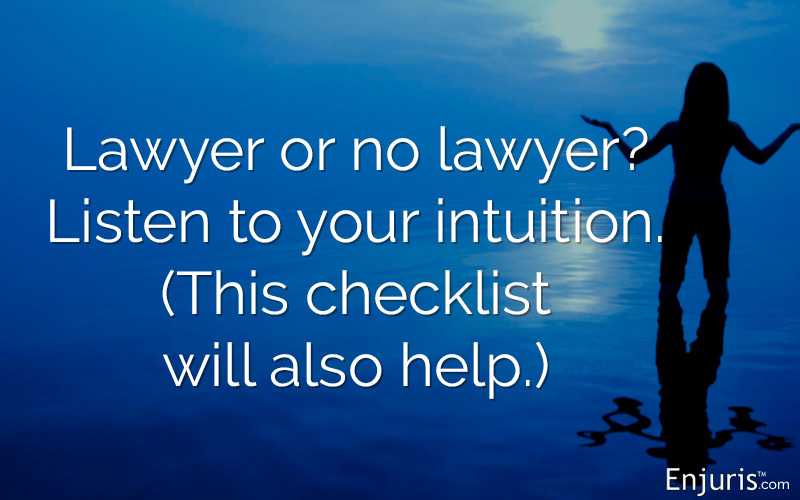 Most law firms offer a free first consultation, so there’s nothing to lose. So i was in a wreck last month on 29th it was a jeep full of teenage boys that did an illegal u turn full force into me and im pregnant so i went to er rignt then well a friend told me try hawk law well they domt seem to be helpin they tryin to make me go thru my insurance for them to deal wit my car and say the other persons insurance will pay my insurance back and i don’t feek i shukd have to go thru mine because i wasnt at fault they were and their insurance hasnt even spoke with them idk what to do but i need a vehicle to go to dr appts. And work which i habe been out of for a week…. Thanks for sharing your story, Angel. We hope you and your baby are okay after the accident. While it may seem counterintuitive, we recommend following your attorney’s advice and filing a claim with your insurance company. In certain states, like Florida, that is how accident claims are supposed to be handled — the victim files a claim with their own insurance company, then the at-fault driver’s insurance company pays the victim’s insurance company back. It may be frustrating to go through this process, but it may be necessary to obtain legal compensation depending on where you live. Ultimately, an attorney will know the best way to secure compensation under local and state law, so follow their advice. Once you file a claim with your insurance company, they may also be able to provide you with a temporary vehicle you can use for work and doctor appointments. Hi there, I was the victim of a car accident which left me with a severe neck strain and a mild concussion. While exiting the highway, we were waiting to go thru a green light behind a bunch of cars that were slow moving. A young man exited the highway as well, apparently just saw the green light and crashed full speed into my car hoping to catch the light. My car is likely total. The kid kept apologizing and admitted to me that he wasn’t paying attention b/c on his phone. Since I was in pain, the police did not take my statement. I went straight to the hospital. Should I add that statement on the police report or is it too late? I believe the policeman told my spouse that he cited the driver w/ reckless driving. His insurance must have talked to him since they are taking full responsibility for the accident. Also, can you ask the insurance to buy you the exact same car or do you have to accept their settlement which is likely lower than buying the exact same car at a dealer? My first car accident. Hopefully, the last one. Advice: wear your seatbelt, it saved my life. Thank you for your help. I’m glad you were wearing your seat belt. It’s probably not necessary to add your statement to the police report since the insurer is taking full responsibility. You can always provide your statement later should the case become a lawsuit. Generally, an insurer will make a settlement offer based on their evaluation of the value of the car. However, you don’t have to just accept this amount. If they make a settlement offer that you think is lower than it should be, you can counter with a higher offer. Because you suffered injuries, I would strongly consider talking with an attorney before you accept the insurer’s settlement offer. An attorney can often get you more money than the insurer initially offers. A woman veered into my car while doing a lane change. Her SUV pushed me up against the curb. Besides damage to my door, vender and front bumper, 3 of my rims are gauged and scuffed up due to hitting the curb and her front right wheel driving into my drivers side. She got the ticket and her insurance company said they’d take care of everything. That was Nov. 11th. Today the auto collision place calls and says her ins. company isn’t paying for the wheels. She damaged them. So now I don’t know what the next step is. Thanks for sharing your story, Sharly. That’s frustrating. We’d suggest talking with your own insurance company to find out the next best steps. If nobody was injured in the accident, then hiring a personal injury lawyer may not be needed; however, if you continue having trouble with the other driver’s insurance company you may want to schedule a free consultation with an attorney near you and see what they recommend. We wish you the best! Thanks for sharing your story, Jewel. Unfortunately, insurance adjustors often try to trick people into saying something that gets the company out of having to pay, as you clearly experienced. While you won’t know the judgement of the insurance company until their investigation is complete, we certainly recommend consulting with an attorney in the meantime. Most lawyers offer a free first consultation, so there’s no cost to you other than your time. Plus, insurance companies are often much more likely to settle – and settle quickly – if/when they find out that an attorney is getting involved. We suggest looking for a well-rated car accident lawyer in your area. Feel free to use our free online directory to help you pick one out: https://www.enjuris.com/personal-injury-law-firms/. Good luck! Similar story. On 12/27/18 I’m at a light waiting for it to turn green in the LEFT only lane. When the light changed I proceeded to enter the intersection to make my left turn when all of a sudden a car quickly pulls up to my right side really close and side swiped my passenger side front bumper and part of the body above the front tire. He doesn’t even stop just kept going. I chase the guy and I caught him. Then I call the police and told him this guy hit/run me but I was able to catch him please send someone quick. Police arrived and take my statement and his. Jan 2, I go to pick up the report and it doesn’t say anything I mentioned to the police officer on it. No hit/run, side swiped, nothing. So I complained it’s wrong please re-do the report and put that he side swiped me and ran because the other driver is denying it to his insurance company. Officer said he can’t get him for hit/run because both of us were on scene when he arrived. But, then officer says to me that “he definitely saw my blue specs of paint on his car” (which immediately should have proven my story and the other driver should have been ticketed for leaving the scene of an accident). So I get the second report and this time it states that I was side swiped on it, but I’m a little worried because he didn’t put he left the scene. But I feel like that report should still prove he still hit me so i send the report to his insurance company to prove my claim. They call me a few hours later to tell me that the police report isn’t good and doesn’t say much and that there going to denying my claim. So what, now? Do I have to go to the police officer again and tell him I want to press charges against him and want a 3rd police report done correctly with driver side swiped and other driver left the scene? It sounds to me like you’re getting the run-around from the insurance company. If you’re vehicle was struck, it doesn’t matter whether the person who struck your car left the scene or not. If there are damages and you live in a fault-based state, then the person who struck your car is responsible for paying the damages. I would recommend contacting a personal injury attorney in your area and explaining your situation. I was in an accident recently where it was determined I was at fault. I can see that my insurance company paid the gentleman what is approximately the ACV of his vehicle and closed the claim a few days ago – so I’m assuming his vehicle was a total loss. Neither of us were injured and we both declined the ambulance. Today his insurance company left me a message asking me to call them. Based on this article I don’t plan on speaking with them but was curious about why they might be calling at this point. Thanks for sharing, Betty. You’re right to be wary about speaking to insurance companies. We recommend letting your insurer know that you are being contacting by the other driver’s insurance company, and also confirming that they’ve paid the claim. The other insurance company may just not yet be aware that the claim was paid, which is why they’re trying to contact you. You may also consider reaching out to an insurance dispute attorney if the matter escalates into a legal battle. For now though, it seems to us like you’ve fulfilled your legal obligations and shouldn’t have to worry. I was recently involved in a minor accident yesterday where an older driver with a pick-up truck made a right turn (from the adjacent lane to my left) while I was waiting in the proper right turn lane to make the turn. The left mid-section of his truck clipped the front right-side bumper of my car. I believe the damage to my car will likely be around $500 (give or take), but that’s what my deductible is. So in all likelihood if I file a claim with my insurance company, I’ll just end up paying for the repairs out of my own pocket (because of the deductible in my policy). The at-fault driver is clearly him–the police deputy who showed up at the scene, even explained that much to him. So would it be better if I just contacted his insurance co. directly, show them the pics of the damages that I took, and hope for a fast and reasonable payout to cover for the damage to my front bumper? Or do I still go through my own insurance (even though they’ll likely stick me with the tab)? Good question. Unfortunately, you’ll likely need to go through your own insurance company. Definitely don’t contact his insurance company directly, as they could try to get you to say something that allows them to deny the claim altogether. I was in an accident recently. Nobody was injured on my side, but my car was totaled. I had a green light and entered an intersection at 35 mph when a driver in the opposing lanes, who had a red arrow, got confused and made an illegal turn right in front of me. If I go thru my insurance there is a 1500 deductible (geico). Since the other driver is clearly at fault and there is a police report, should I file with his insurance to get the most money back? Are there any tips for getting the most for the car and not just kbb value? Should I threaten to contact an attorney if they are low-balling me? My neighbor a couple houses down blacked out and took out both my vehicles and the neighbor between us fence. Totaled both my vehicles. I am without a ride and they are not even going to pay my vehicle off. As I still owe on one of my cars. I don’t know what to do. It looks like I am going to have to still make payments on a vehicle I can’t drive so my credit don’t go bad. Any suggestions on what to do? Thanks for sharing, Brandy. While we can’t say for sure without knowing more details about your case, it sounds like your insurance company should pay for medical expenses and then the get reimbursed by the other driver’s insurance company. Although it sounds like you prefer to deal with your insurance company and that’s fine, do keep in mind that it doesn’t necessarily mean they’ll be looking after your best interests. The main goal of any insurance company is to make money, which sometimes means limiting payouts — even to their own policyholders. Be careful when dealing with any insurance company — not only the other driver’s insurer but your own as well. You can always talk to an insurance bad faith attorney if you feel like you aren’t being treated fairly. Good luck! I was just waiting for a car parked in front of my car. A car cuts my lane and hits my front left panel, i have no time to reverse and horns when he turns right to my lane. The other party’s back right panel hits my car. His insurance company called me to claim. I gave statements and explain that the other party is at the fault. The insurance company ask me for a sketch and a clear statement of what happen. They emailed me the form and gave me no due dates. my car is not insured. May I know what to do next, sketch and gives direct statement on paper and send to them about what happen or ignore its form. Its been 2 weeks they have not called me for the form. I would consider meeting with an attorney in your area before providing the insurance company with any written statements or drawings. You can use this directory to locate an attorney in your area: https://www.enjuris.com/personal-injury-law-firms/. Most attorneys will provide an initial consultation free of charge. I was in a hit n run but got the person’s car plate number. turns out the person has the same insurance as me. I’m not able to use medical insurance to get medical help. the insurance company wants me to pay out of my pocket and then give them all receipts but I can’t afford plus don’t have a doctor to go to. What can I do? What are the procedures? There was no damage to my car because of older 1999 Buick I took the impact. I’m sorry this happened to you. If you don’t have insurance that will cover your medical bills, you might be able to setup a payment plan with the hospital. I would recommend contacting the hospital about this option. In the meantime, I would recommend consulting with an attorney. An attorney can double check your insurance policies to see if there is available coverage (and can also talk to your insurance company). An attorney can also start a lawsuit to recover money that can then be used to pay off your medical debt. I was hit by a car as a pedestrian in the beginning of the month. I am luckily pretty okay. I’m just wondering what protocol is with getting Pain & Suffering from the drivers insurance company is. They’ve been trying to schedule to meet in person, but my family has said that sounds sketchy and to not meet in person. I don’t think there is enough damage to involve an attorney, but I also don’t want to make the wrong move and jeopardize what I can get. Is it normal to meet with the claims adjuster in person, or can all deals be done over the phone? Thanks! You wouldn’t be able to sue for the full amount if your insurance pays you. Instead, the insurer would seek reimbursement. Usually, your insurance company would reimburse your deductible once they recover the full amount from the other party. I was walking out of Walmart pushing my buggy. I saw a car coming from my left about 3 car lengths away not in the crosswalk but I was in the crosswalk. Before I knew it the car didn’t stop it struck my buggy and the impact threw me to the ground landing on my left hip which I kew was broken. I was taken to the hospital by ambulance. I had a Hip contusion and a strain knee. I was put on pain meds and a brace on my knee. This happened on a Saturday so I was laid up Saturday, Sunday and I missed work on Monday. This is Thursday and I still very sore in my left buttock. I have to sit on a soft cushion. My hospital and ambulance ride is around $2000. Do I need to wait to see what the insurance company will offer me? What should I ask for pain and suffering. Which I am still suffering. How long does it typically take for the victims insurance to recoup their money from the at fault persons insurance company? It really depends on the case. It can be a couple of days or a couple of months. I would recommend contacting an attorney if you’re worried that your insurance company is doing something improper. I was involved in a collision where I t-boned a car that pulled in front of me from a stop sign. My dash cam showed the impact was a 40mph. My truck was totaled and I dealt only with my insurance on the property claim which is completely settled. I went to the local ER after the accident as my chest was sore and bruised and my neck was painful and stiff. Fortunately my sternum was not broken. I sought treatment from a local Chiropractor for my neck pain and was released after 28 visits. My total medical bills are over $6K. These bills have been submitted to the other parties insurance but they are extremely slow in responding. I paid part of the bills as they were hounding me for payment. So, how long does it usually take to finalize the injury portion of a claim once they have all the info? thank you advance. I was in a car accident this past Tuesday, I was rear ended and 3 other cars where involved ” I did not hit any of them” after i tried to get a police report on Friday the officer said that the collision was deemed “Not Re portable”. But all 4 cars where towed off the scene and the damages alone to my car where in excess of 4000 dollars. Sometimes the police don’t file a formal report. It depends on the state and the situation. However, you might not want to take the officer’s word for it (they could be mistaken). You can file a public records request to obtain the police report. If there is no report, the public records department will be able to confirm.